"As part of [the magazine's] strategic planning process, we recognized that our online presence could use some work. Our website was out of date and running on a clunky platform. We are in the process of moving our online archive over to WUIS’ website, so we can take advantage of their content management system, which is frequently updated by NPR and includes design elements that will hopefully make our work easier to read on mobile devices. The merger allows us to do this at no cost to the magazine and gives us a major online upgrade that we would have otherwise been unable to afford. 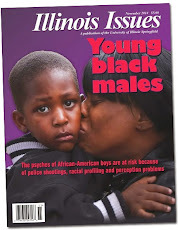 To find stories from the current issue, as well as recent stories, go to wuis.org and click on Illinois Issues, which is the first button in the navigation bar. (You can also follow this link.) For a period of time, traffic to our previous website will be redirected to WUIS.org. You can also find many of our stories posted on our Facebook page and you can follow Illinois Issues on Twitter @capitolbureau. If you have any thoughts on how our webpage might be made more useful to our readers, we would like to hear from you. Soon after WUIS and Illinois Issues came together, we held a staff meeting to talk about the merger and our strategy for news coverage. The staff put forth topic areas that they thought should be our priorities. Out of that list, we have developed beats for each reporter to focus on that we have dubbed our Illinois Issues. They include: the arts and culture; education; equality; the economy; food, health and fuel; government effectiveness; and government sustainability and leadership. ... Our goal was to organize our efforts in a way that would allow each journalist to develop sources and become somewhat of an expert on his or her topic. Many topics cut across several of these beats, so we plan to work collaboratively and pool our knowledge to bring you the best information that we can. In some cases, reporters may team up to tackle special projects. This strategy should allow us to bring coverage that is more forward-looking than simply tracking legislation as it moves through the process. We will strive to provide a deeper understanding of the topics of the day and get in front of subjects that will be important in the near future. Focusing on these areas does not mean that we will entirely skip coverage of other topics. News will still break, and WUIS will continue to bring that daily coverage to the radio and the web. But we also hope to produce in-depth stories on how policy affects the lives of citizens and civil servants outside of the Statehouse." You can read the entire column here. Given that Blogger is a bit behind the times, too, we will no longer be using it for blogs. Instead, blogs on a variety of topics will be at WUIS.org. A few months ago I asked for your thoughts on this blog. For those who responded, thank you for the feedback. Most of the response from readers was that you use this blog for unbiased information about the day-to-day action in state government. In my new role as editor, I will not be able to continue tracking action on every topic, but I will continue to write posts focused on budget issues. My new blog is called Past Due, and you can find it here. It is with some sadness that I say goodbye to this blog. Former Illinois Issues Statehouse Bureau Chief Bethany Jaeger truly made it what is was, and I worked hard to continue what she started. Thank you for reading this blog over the years. Our dedicated followers made the late nights, early mornings, bad coffee and scrambling to digest new bills and break them down all worthwhile. I am excited about our new strategy and the possibilities that having a larger team bring us. I hope you will continue to follow our work as we seek to explore and explain policy and government with this new approach.